Soft, festive gingerbread man cookies with warm winter spices – made from scratch and all fancied up for the holidays! Get the recipe and whip up a batch this weekend. Bring in the merriment and mugs of cocoa, y’all! I am admittedly obsessed with Christmas this year. The house is glittering and gorgeous and dripping with holiday cheer, but the amount goodies my oven is churning out is getting ridiculous. Though, I’ve discovered something. It’s not as much about how much I love sweets as it is about keeping my body from turning into one giant icicle. A warm oven churning away keeps the house cozy, right? … Can you tell I live with a man who refuses to budge on the thermostat? I’m not getting any complaints from him on all the cookies (and slightly higher electric bill), though. This past weekend brought heaps of buttery jam thumbprints, salted caramel sauce, peppermint marshmallows, and stacks of these scrumptious golden gingerbread men… so cute you could gnaw their little arms and legs right off! 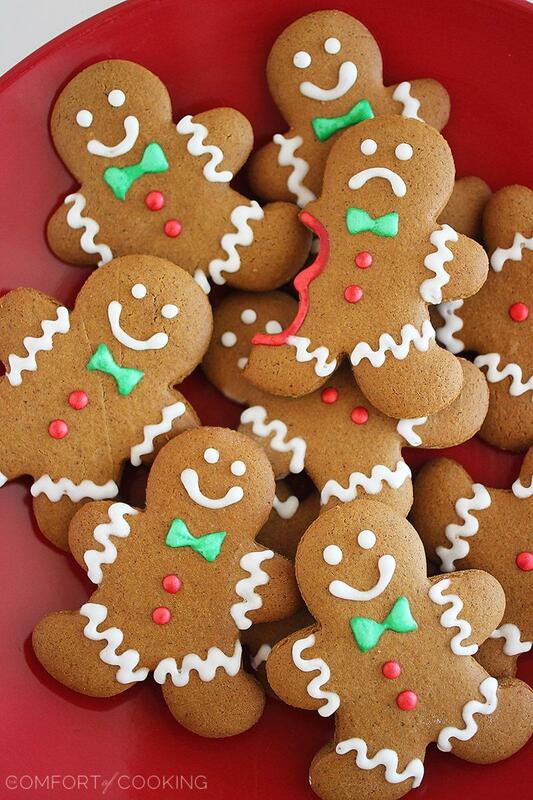 … Or maybe that was just all the other gingerbread men not playing nice. They’re gonna be on Santa’s naughty list for sure! Gingerbread men have been on my must-conquer cookie list forever, and I was so happy to have such great success with this recipe. You’ll love it for your Christmas cookie baking, and these make great gifts, too! The dough was easy peasy to roll, and by cutting the shapes and freezing for a few minutes before transferring to your cookie sheet, your gingerbread men don’t get warped by your warm hands. Loved that tip by the recipe’s rave reviewers! A fine tipped squeeze bottle made piping on the royal icing a breeze, and so far they’ve stored beautifully (nice and soft) for 5 days in an airtight container. Totally my go-to holiday cookie for years to come! In collaboration with Zappos, I put my own sweet spin on a recipe they suggested to me, to share with you! They’re in my turf of Austin, TX this weekend (Dec. 14-15), touring the city with their gingerbread man. You can follow his adventures at #ZapposGingerbreadMan and be eligible to win great prizes if you do! Anyway, back to the good stuff. COOKIES! 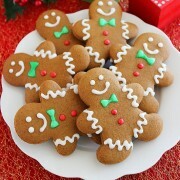 You’ll love these easy, festive gingerbread men loaded with warm winter spices and cheery charm. The dough bakes up a spicy, soft cookie that creates an incredible aroma in your home. Plus, these little men are just as delicious as they are cute to look at! Whip up a batch this weekend to get in the holiday spirit, and sneak a batch over to someone on Santa’s “nice” list! In a medium bowl whisk together flour, baking powder, baking soda, salt, ginger, cinnamon, and cloves until well blended. In a large bowl, or the bowl of your stand mixer fitted with the paddle attachment, beat butter, brown sugar, and egg on medium speed until well blended. Add molasses and vanilla. With your mixer on low speed, gradually stir in dry ingredients until blended and smooth. Gather dough with your hands into a ball and divide dough in half. Shape each half into a round disk and wrap each half in plastic. Refrigerate up to 4 days. Let dough come to room temperature before using. When ready to bake, preheat oven to 375 degrees F. Line 2 large baking sheets with parchment paper. Roll each portion of dough 1/4-inch thick between two sheets of waxed paper. Cut out shapes with cookie cutter. Remove excess dough from around the cookies (as best you can), and transfer wax paper sheet to the freezer. Freeze for 10 minutes, then remove shapes to your lined baking sheets, spacing 2 inches apart. This makes transferring the cookies while keeping their shape SO much easier! Bake 1 sheet at a time for 7-9 minutes. Let cookies rest on baking sheet for 2 minutes before removing to a wire rack. Once cookies are completely cool, decorate as desired. Make royal icing by combining 1 Tablespoon meringue powder with 2 cups powdered sugar and 3-5 Tablespoons water in the bowl of a stand mixer. Using the paddle attachment, beat icing until smooth and matte, about 5 minutes. Add more water to thin, if necessary. Separate icing into batches and tint with food coloring. Using piping bags or squeeze bottles with fine tips, pipe icing onto cooled cookies. Store in an airtight container up to 1 week. Disclosure: A similar version of this recipe was suggested to me by Zappos and I was compensated for my time, but all opinions are my own. Gah! These are too cute Georgia!! Love it. These little guys are adorable. Very happy that you found a recipe you like. Don’t you just love the smell of gingerbread baking in the oven? Have a wonderful holiday! I’ve never seen such picture perfect gingerbread cutouts, Georgia. So cute! I do gingerbread men every year — they’re my favorite! Yours are adorable…even the naughty one! Adorable, just adorable. And thanks for the tip of the squeeze bottle, great idea! your cookies look perfect, so flawless. Dang if those aren’t the most perfectest little men ever!!! I had high hopes of getting around to making gingerbread cutouts this year, but it hasn’t happened yet. These cookies are positively adorable, Georgia! So stinkin’ cute! And I love the one with the frown and bite out of it! Merry Christmas! 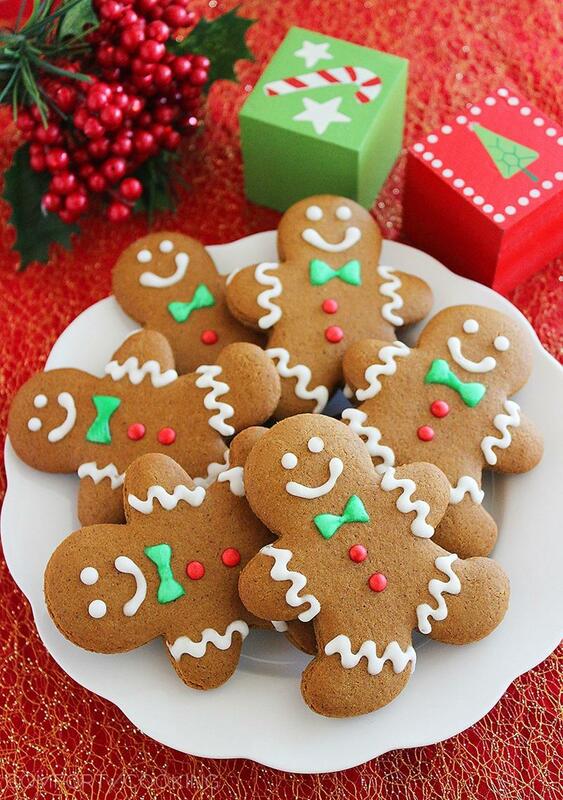 These little gingerbread men are adorable! yayyy for lots of baking! 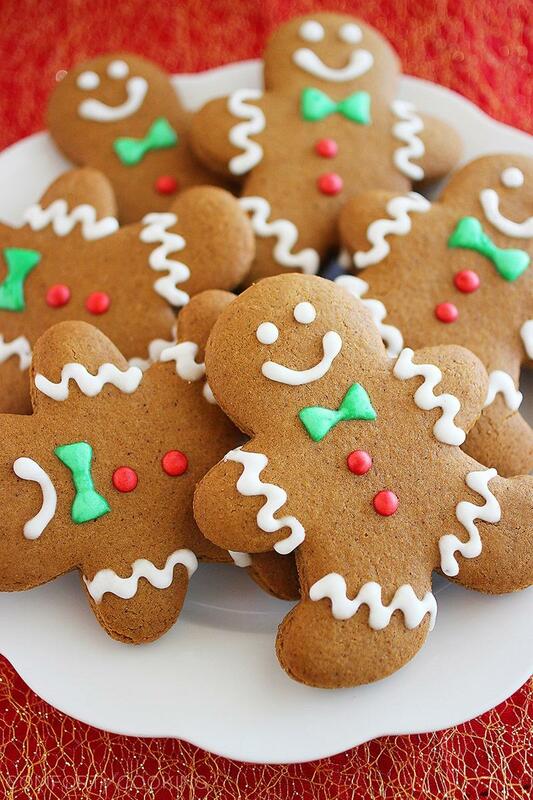 These gingerbread men are SO cute and perfect, and I can practically smell how delicious they are! These are so cute! I made gingerbread men to share tomorrow, and they did not turn out this cute! My frosting job is just not as good – love the bows! These are adorable! I stink at piping…and wish I could make a gingerbread man half as cute as yours!!!! So cute, Georgia! Piping definitely is easier from a squeeze bottle for beginners. Gorgeous photography as always, my friend. Thanks for sharing. Pinning! I have been craving gingerbread cookies for a few days now. These look like the perfect recipe! These photos and these cookie are gorgeous! I would love to find some time to make these! PINNED! How cute is this?! And that frownie gingerbread man is adorable. These cookies are so cute! They sound delicious! And I know what you mean about the thermostat. I have the same problem, and I’m in New England and it’s coooold! Oh my goodness, these are adorable!!! I was going to make gingerbread men this year, but haven’t had the chance yet!! Georgia, these are just perfect. Love the little man without an arm and a sad face. I laughed out loud seeing that one! Also – their bow ties. Cutest cookies in the world. Yes turning the oven on to keep warm sounds like the perfect excuse to keep baking!! These are too cute, love how puffy the cookies look! 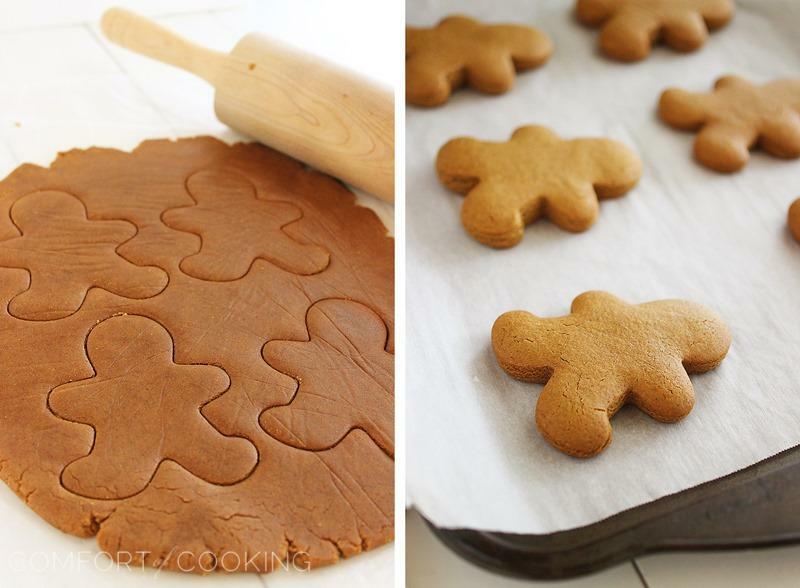 These might be the cutest gingerbread men I’ve never seen – I love how puffy they are! Beautiful job on these gingerbread men, Georgia! Picture perfect! One of these years I’m going to get motivated to make Christmas cookies! Thanks for a great post! They look picture perfect, Georgia. Totally cute! These are so perfect! I love gingerbread men but can never get them a consistent thickness, I am a terrible dough roller. Gorgeous job! These are sooo cute, Georgia!! Hope you guys have a happy holidays!! I can never resist gingerbread men! When I was a kid it was my favorite cookie. And one that I still like a lot now. Great decorating job! Aw these are the cutest gingerbread men I’ve probably ever seen! I love that frown faced one! Scrolling down I was like wait… was that just? Made my day. These look delicious! These cookies are just so darling!! Awh, those look really good! You shouldn’t make any with sad faces!! These are adorable, Georgia! And I bet they’re just as delicious, too! These are so stinkin’ cute! Love the little guy with the bite out of him, he’s frowning because he knows what’s next! These are soooo cute! You decorated them perfectly! These are the cutest cookies ever, Georgia! :) Sooo so adorable. I have a question: Here in Belgium, we don’t have ‘molasses’. I googled it and i think it’s some sort of syrup. What would you recommend to replace it with? Is it a crucial ingredient? Molasses is essential to gingerbread, so unfortunately I’m not aware of any substitutions. In Europe, molasses is called treacle. I searched the internet and spent a lot of time reading & comparing recipes before opting to use yours, and it was marvelous! Your ratios used more vanilla and a winder variety of spices than most – plus I thought your suggestion about freezing the dough would be a helpful step. Bottom line: these cookies are delicious! A total winner that I’ve printed and will save for future years. Note: we subbed milk-free butter for the traditional butter, and the taste and texture were still just wonderful. Any other icing suggestions? I don’t really want to buy meringue powder as I don’t foresee needing to use it again. Thanks y’all! Can’t wait to try this recipe! My son loves to bake with me! You can frost these with a small piping tip with any homemade icing, though just keep in mind it won’t set firmly like the icing shown in this recipe. I think Wilton may make some premade royal icing, which you can find at craft/cake decorating stores. These were so delicious and soft…will be using this recipe again and again!! Thank you. I just found this blog and it’s wonderful!! Nice pictures! Hi I copied your recipe to the T and my gingerbread men came out rock hard. What could I have done to get them to come out soft? I’m generally to blogging and i truly appreciate your content. The article has actually peaks my interest. I am going to bookmark your web page and keep checking for new information.